New edition of BeachcombersAlert! available here. Lively as-told-to autobiography of a scientist who studied flotsam—floating trash—and revolutionized the study of the world’s oceans. Ebbesmeyer graduated college as a mechanical engineer in the mid-1960s and went to work for Mobil/Standard Oil, which financed the doctorate studies that made him the company’s first oceanographer. Years of traveling the world gave him an intimate knowledge of how ocean movements affect oil rigs, but he grew increasingly fascinated by sea currents and eddies and began to focus on beaches, more specifically on debris deposited there. An epiphany came in May 1990 when a Pacific storm knocked five containers filled with thousands of athletic shoes off a cargo vessel. Nearly a year later, the shoes began washing up along the West coast of North America. 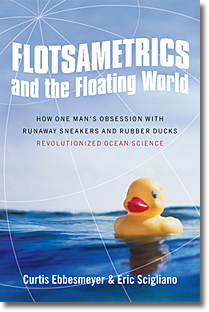 With the help of a surprisingly large and cooperative fraternity of beachcombers, Ebbesmeyer tracked the progress of the shoes up and down the coast and as far as Hawaii, producing a groundbreaking study of ocean currents. With the help of maritime and environmental journalist Scigliano (Michelangelo’s Mountain: The Quest for Perfection in the Marble Quarries of Carrara, 2005, etc. ), Ebbesmeyer spins a fascinating tale. Even readers with little interest in ocean science will be riveted by the author’s chronicle of the epic travels of oceanic trash; the entertaining explanations of how floating debris guided Christopher Columbus and the Vikings to safe harbors; the horrific stories of men adrift at sea; how flotsam may have triggered the origin of life; and frighteningly, the warnings of the threat that an increasing avalanche of plastic waste poses to the oceans. A captivating account of the man who turned beachcombing into a science.